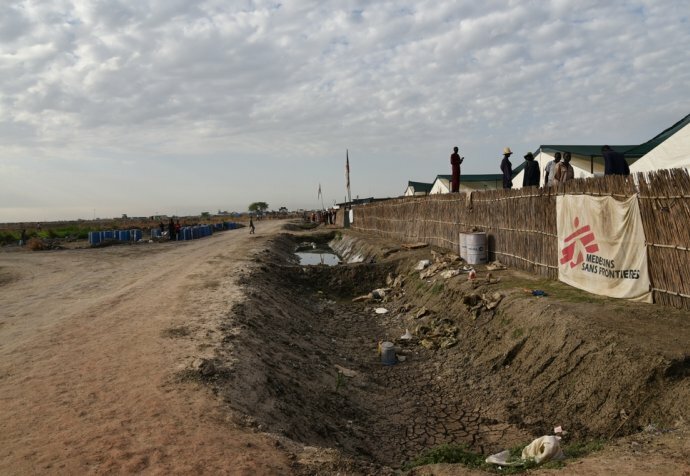 New Zealand nurse Catherine Flanigan recounts her first field experience working with MSF in the Protection of Civilians (PoC) site in Bentiu. Being my first mission, everything was challenging to begin with! There were so many medical needs and it was hard not being able to fix everything. In the Bentiu PoC site, MSF is running a 160-bed hospital for a population of almost 115,000 people. On the first Sunday that I was there, we had over 500 presentations to the emergency room alone. There were patients on every inch of the floor and nowhere else for them to go. "There were patients on every inch of the floor and nowhere else for them to go"
As Nursing Unit Manager, I supervised the outpatient department and the emergency room in the hospital, plus organised staff for the malaria clinics in the PoC. The clinics were established to relieve the hospital from the overwhelming number of malaria patients. Each clinic would see about 200 patients per day; if the patient had simple malaria they would be treated in the clinic and sent home, and if it was more severe they would get referred to the hospital. Back in the hospital, I would spend my day in and out of the emergency room, organising supplies and staffing, and helping with critical patients. I also ran training programs on patient assessment, nursing skills, diseases, and MSF treatment protocols. In preparation for an overnight shift, I would review the contingency plans and prioritise critically ill patients. The responsibility was quite nerve-wracking but it was a good opportunity to be involved with the patients and focus on the clinical aspect of the job. Plus, you get to know your staff a lot better when you’re all working together at early hours of the morning! "Their ribs were visible with every breath, they weren’t feeding and they were very drowsy"
One night a set of twin boys came in with severe malnutrition and respiratory distress. Their ribs were visible with every breath, they weren’t feeding and they were very drowsy. Although we gave them antibiotics and careful amounts of fluid and oxygen, we weren’t expecting them to survive the night. Sadly, the bigger boy died and we didn’t hold out much hope for his brother. I remember the blank look on their mother’s face. She was in complete shock. I handed over to the morning staff, resigned to the smaller twin dying sometime that day. Days later, I saw the mum was still in the ward, sitting beside a pile of blankets, which she lifted to reveal the smaller twin. He was alert, off the oxygen support and doing really well. I loved working with our local staff, many of whom have been working with MSF for a long time. They have this amazing institutional memory and it really made the team feel like a family. They’re working under difficult circumstances – in tents, mud and dust – with limited equipment, unpredictable workloads, and facing varying waves of disease and outbreaks of violence. "They’re working under difficult circumstances – in tents, mud and dust – with limited equipment, unpredictable workloads, and facing varying waves of disease and outbreaks of violence"
When malaria and pneumonia seasons coincided, we had to open two extra paediatric tents to cope with the overflow and the staff just put their heads down and handled it. They came from diverse backgrounds – some had been geography teachers, lawyers or church ministers before they ended up in the camp and now they’ve put their hands to working in healthcare. They’re coping with a lot of stress, many have been separated from their families because of the insecurity, and some hadn’t seen their kids for a couple of years. But they put it aside and come to work every day. They take pride in serving their community. It was also rewarding when we could send long-term patients home. We had one little girl who came in with diabetes, and the doctors worked hard to get her stable with the limited supplies we had. She hated all the pricks, jabs and medications, and would cry when she saw us coming. She gradually came to accept them (partly due to all the stickers the nurses gave her). She was with us for months before she stabilised and went home. Every week she would come in for tests, dressed in her best, with a big smile, to see all the staff again.